Real Wages - back to the '70s? Real Wages – back to the ’70s? As the TUC noted today real wages have been falling for 40 months in the UK, the last time average wages grew by more than inflation came all the way back in November 2009. The chart below provides some context to this, it uses data from the Bank of England’s Three Centuries of Data spreadsheet to show inflation (in this case CPI), wage growth and real wage growth from 1855 to 2009. We are now in our fourth year of falling real wages, something which hasn’t happened since the ’70s. The 1870s that is. 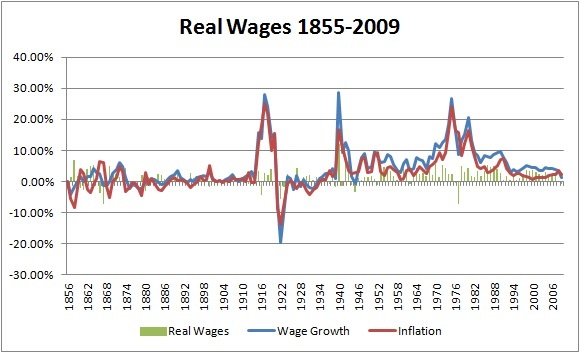 The last real wage squeeze of this duration seems to have been 1875-1878. This is why the TUC’s latest campaign is entitled, Britain Needs a Pay Rise. 3 Responses to Real Wages – back to the ’70s?